In a notice posted to the ITC website (PDF link), the commission sided with Apple's reading that a key claim in Qualcomm's U.S. Patent No. 9,535,490 is invalid based on prior art. Specifically, Apple presented "clear and convincing evidence" that Qualcomm's IP claim, leveraged as ground for infringement, is obvious in respect to two previously issued patents. In effect, the commission denies the original granting of Qualcomm's claim, allowing Apple to skirt a ruling on potential infringement. As a result of the determination, one of Qualcomm's bids to obtain a U.S. import ban against certain iPhone models has been quashed. The decision concurs with a ruling from Administrative Law Judge Thomas Pender, who in September issued an initial determination regarding the '490 patent and two other Qualcomm patents claimed infringed. While the ALJ found potential infringement of the '490 patent — subject of today's final determination — Apple was absolved of impinging on Qualcomm's U.S. Patent Nos. 8,698,558 and 8,633,936. Pender recommended against an exclusion order, saying such action would be counter to the public interest. The commission adopted the initial determination of non-infringement in regard to the '558 and '936 patents, and resolved claim 31 of the '949 patent. Today's ruling effectively clears Apple of a possible ban on iPhone models using Intel chips instead of those supplied by Qualcomm. The decision arrived hours after an ALJ in a separate case recommended a partial iPhone ban after determining technology in Apple's smartphone to be in infringement of one Qualcomm patent. A full commission review on the initial determination is slated for July. Apple and Qualcomm are embroiled in a bitter legal struggle that spans courts and regulatory agencies around the globe. Apple kicked off the spat in 2017 with a suit claiming Qualcomm abuses its monopoly power in the wireless modem industry to demand excessive royalty rates. 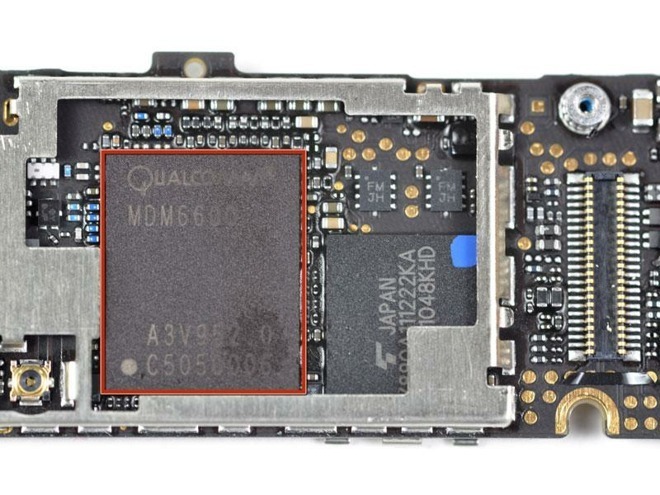 Most recently, a U.S. federal jury earlier this month found Apple in infringement of Qualcomm IP, awarding the chipmaker $31 million in damages. "We're pleased the ITC has found Qualcomm's latest patent claims invalid. It's another important step to making sure American companies are able to compete fairly in the marketplace. Qualcomm is using these cases to distract from having to answer for the real issues, their monopolistic business practices. They are being investigated by governments around the world for their behavior, and we look forward to detailing the many ways they're harming consumers and stifling innovation when we present our case in San Diego next month."